At least 10 gunmen were killed in a battle with Israel Defense Forces soldiers in the Gaza City neighborhood of Sheikh Ajalin, news agencies reported Sunday morning, quoting Palestinian sources. Several minutes later, Palestinians reported that four people had been killed in the norhern town of Beit Lahiya. The IDF reported hitting dozens of gunmen across the Gaza Strip on Saturday night and Sunday morning. Hamas and the Islamic Jihad reported that their fighters had encountered an IDF ambush. The battle in the Sheikh Ajalin neighborhood in western Gaza may be an indication that the forces are approaching Gaza City. 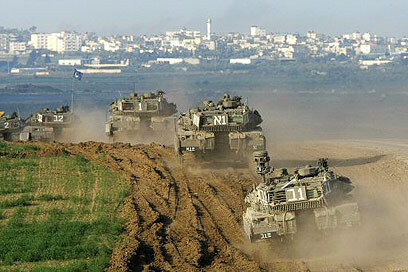 Earlier, Palestinians reported of tanks and armored forces making their way to Gaza through the neighborhood. Hamas reported of heavy exchanges of fire in the area. The organizations said they were firing mortar shells and antitank missiles at the advancing force. Palestinians sources reported earlier that IDF forces were advancing towards Gaza City. According to the reports, dozens of families with children abandoned their houses in the Tal al-Hawa neighborhood. The Palestinian death toll since the start of the Israeli operation has reached 858. Earlier Sunday, the Israel Air Force attacked the home of Ahmad Jabari, the commander of Hamas' military wing in the northern Gaza Strip neighborhood of Sajaiyeh. According to estimates, Jabari was not in the house, as he is managing the fighting against the IDF from a hiding place. Some 50 Palestinians were hurt in the incident. Sources in Gaza reported that the rescue forces were experiencing problems reaching the casualties due to the massive fire. It was also reported that Navy ships were firing at several targets in the Strip. See all talkbacks "Report: IDF kills 10 Palestinian gunmen "